According to statistics taken from the years 2003 to 2007 from women, breast cancer varies a little bit by state, but with no real stand outs. The USA state with the highest rate of breast cancer in women from these years was the District of Columbia, with 139 cases per 100,000 women. These cases were all invasive breast cancer. The state that has the lowest number of invasive breast cancer cases per one hundred women is Arizona, with only 104 cases. 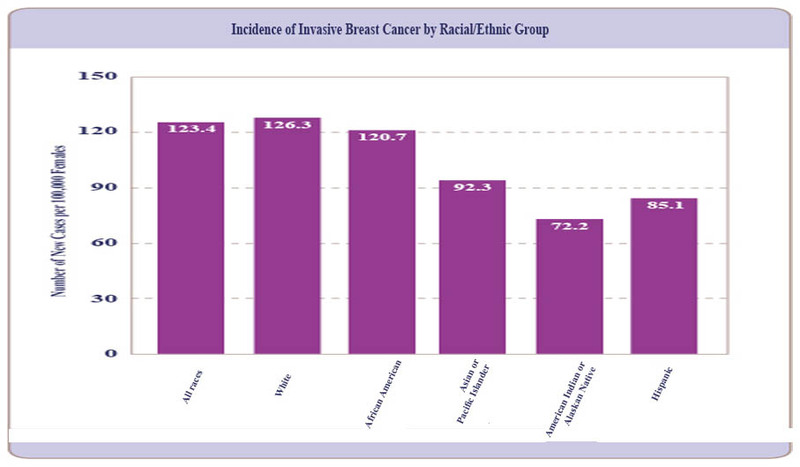 There has not been any definitive links shown to certain geographic areas or states to the cases of breast cancer. Age is one of the main risks for breast cancer. In fact, the two primary risk factors are being female and age. Women have more of a risk for this type of cancer the older that they are, with most cases occurring after age fifty. This is why it is so important to get checked early and have it detected as quickly as possible. Five percent of breast cancer cases happen in women that are under the age of forty, with the other ninety five percent in women older than that. It should also be noted that while the risk of breast cancer is low in younger women, there are certain genetic factors that increase the risk. Another statistic is regarding pregnant women. For every 100,000 pregnancies, there are thirteen cases of breast cancer, and it may be harder to detect breast cancer when the breasts are swollen or lactating. According to data from the World Health Organization (WHO), breast cancer is the leading cause of death in women worldwide. Each year, there are more than half a million people that die from this disease. More groups exist to fund research and educate people about breast cancer than any other type, including the Susan G. Komen for the Cure Foundation.